Wouldn't it be great if this set of French Doors didn't take up floor space when they opened? Now you can have your home exactly the way you want it with pocket doors that recede into the wall space. 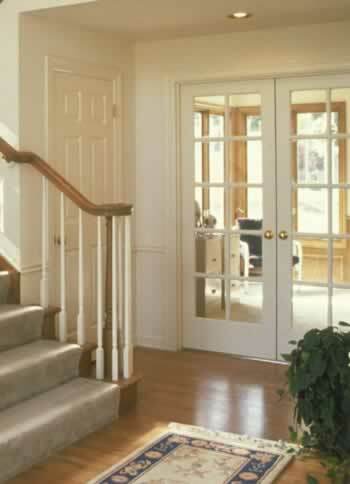 The classical, ten-panel, windowed doors rely on contemporary bearings and remain anchored to your floors and walls for durability. They're mounted in steel frames that won't warp over the years. You can choose from a wide range of colors in the powder coatings that protect your door. They clean easily with warm water and mild detergent. You can select hardware to suit your theme. This set of pocket doors open up your home, allowing ambient lighting to fill the rooms. At the same time, these energy efficient models can help cut your heating and cooling bills and add soundproofing in your bedroom, den, or home office.